Thanet Life: It's a Fair Cop Guv? I'm home from the Council's Standard's Hearing and although I've been warned not to write about it or indeed, include, anything even vaguely satirical or disrespectful, I thought readers might wish to know the result. So with the greatest respect, according to the panel, I am now 'Guilty of bringing the Council into disrepute' and it is agreed, that I should be both publically censured and that my name should appear on the Council website to shame me for a period of three months. I'm not required to write any further apology to Cllr Dr Jack Cohen for describing him as 'Sober' or anything else. It was conceded that his well-stocked and 'Legendary drinks cabinet' is a matter of fact and well-known hospitality but that my use of satire,described as being a mixture of Punch and Private Eye, to describe council meetings and councillors represents a breach of the code. Over on ThanetOnline, Michael Child makes a regular point of being critical about both the Council and some Councillors grasp of the Internet. What I did quite energetically express to the panel, is that the Council is falling behind the times in attempting to tie-my hands, through arguing that I'm always on duty and thus cannot pass comment or report, here or elsewhere, without potentially breaching the standards code. I might add, that in other recent and well-publicised political debacles, it appears other independent councillors appear to have escaped the level of censure applied to me, which I find curious. While the panel busied itself examining the evidence, two of the complaints made by Cllr Dr Jack Cohen, were more serious allegations, that I might argue were both capricious and malicious were thrown out. I would direct your special interest to the first screen shot, which I would ask you to try for yourself and apparently was reason to raise a more serious complaint of 'anti-antisemitism'. 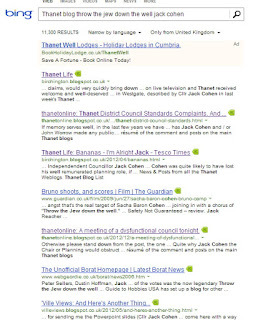 As far as understand the argument, if you put an 'antisemitic' expression into a search engine, like BING, against the name of a respected local councillor and "Thanet Blog" and this returns 'ThanetLife' at the very top of the search list, then this is sufficient for the complainant to argue that the weblog is antisemitic in character. I'm not making this up! And the screenshot evidence is attached. While you are trying to get your head around the rather confused logic of this argument in the first screen shot let me try you on the second. This is a YouTube clip of the Fast Show uploaded and posted by 'ptekptek' and which has had over 800,000 views. 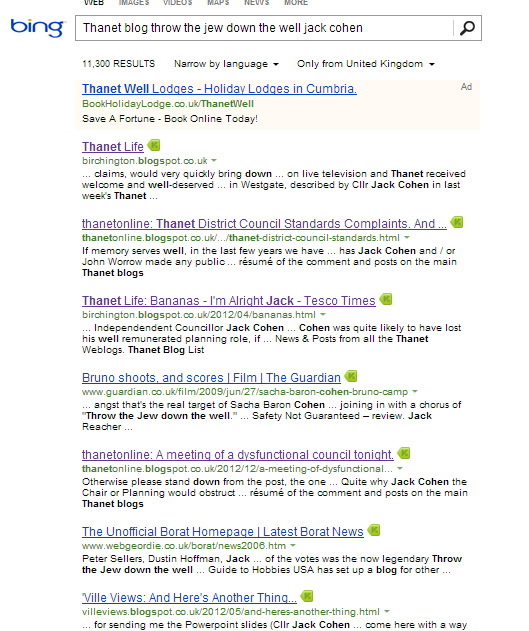 The argument here, appears to be that because I once used this clip to illustrate an entry on ThanetLife, I'm responsible for the 248 comments, that go with the clip on YouTube and which are in someway perceived to be directed at an obscure councillor, who is offended by the video. If you happen to be a Monty Python fan, as I am, then you'll immediately think of the clip below, from Monty Python and the Holy Grail. I'm baffled by some of what I've read so far and a number of other surreal arguments in the document in front of me. In my view, these both defy simple logic and show a complete lack of understanding of how the internet and its popular search engines work. What worries me more is that public money is being spent, pursuing what appears to be a political cameo of the Monty Python farce below. But perhaps I'm living in some strange, alternate island reality instead. Unfortunately, as I commented to Cllr Alasdair Bruce, my 'friend of the accused' this morning, the cost of this whole exercise quite possibly exceeds the entire floral budget for Birchington this summer. I will also be in hot water for adding the very satirical but unrelated video clip shown below. Simon you should be proud to have been compared with Punch and Private Eye - that's a result I think! Simon, Can you clarify please. Was it argued that you are on duty 24/7. So your punishment for this ridiculous result is 3 months of 'shame' on the council website - so what is Worrow's punishment going to be for failing to apologise for his offence, as decreed by the same board? I was thinking of public humiliation but he does that himself every time he opens his mouth! Apparently and as I understand the verdict, there is no distinction between Simon Moores, blogger in a personal capacity and Simon Moores, Councillor, under the code of conduct as it is interpreted in this sense. In the same way the law decrees it is impossible to libel someone who has already lost their reputation, couldn't you have argued that it is impossible to bring into disrepute a body whose image is already in tatters? Who are this board? Sounds like they need reporting for inconsistency. Oh for heaven's sake, why can't people just say whatever they like (within the confines of the libel laws)? Simon, 1:57 is absolutely correct, there are unanswered questions here, first 1:57 is correct how is it that Cllr Dr Cohens Leader Worrow, continually escapes censure for his antics, and also his hateful Minnis Pig watch Blog written on his Groups Blogsite ?. In addition if anyone has brought the Council into disrepute it is Worrow with his antics in Chamber, in the Press and on TV, not forgetting his Blogs in the past. Simon I cannot understand if the decision has been made and you are to appear on the TDC website as a "naughty boy", then surely it is in the open and you can now discuss it what have TDC got to hide?. One last question whilst you appeared before the "Court" was Worrow present to support Cllr Dr Jack Cohen?. Simon, this is yet another case where everyone is in the wrong except TIG. Keep smiling be happy, this is democracy TIG style. Sorry to hear of this daft procedure/result/waste of time and money. Seems to me that ALL the TDC councillors on committees are guilty of bringing us all into disrepute and surely making Thanet the laughing stock throughout the UK. Forget diversity/insults/personal agendas ... get on with PROPER council duties. Cllr Cohen and Cllr Worrow weren't present. It was just me "in the dock" this morning! So if you're "always on duty", then surely the same should apply to all councillors when making phone calls to other councillors? No, that argument doesn't extend to one-to one personal communication between councillors outside public duties. Who were these panel members - TDC officers ? It is they who have brought the council into disrepute with this crazy verdict. As a TDC council tax payer I'd rather have my money spent on something worthwhile e.g. street cleaning. I'm shocked... and I would like to offer my services to you Simon so that from this point forward ThanetLife posts will be from an anonymous poster, I will use the pseudonym of "Mr Cox" or "Dr Box" or "Master Lox" or "E.Pox esq." What a load of rubbish and as already has been said a waste of our (the tax payers) money! Just as well that Messers Cameron, Milliband et al are not quite so sensitive....or paranoid! Not sure pseudonyms will get me off the hook but this did work rather well for the mysterious and fantastic Mr Fox as the administrator on John Worrow's blog. To whom does one report the so called standards board to for bringing standards boards into 'disrepute? How do the public elect the standards board? and how does 'Joe Public' sack them? And finally...do any of them have a sense of humour? Anti-semitic is a bit strong. The late Richard Rapier Stokes MP (Labour) is widely described as an extremist catholic anti-semite. But there again he did get a whole SS Divn to settle in UK postwar and was something of an admirer of the Nazis. I provide information from time to time to Simon Wiesenthal organisation. (Methods used to smuggle nazi war criminals to UK postwar and uses the settled SS Divn may have been put to and the consequences to this day) But in my one dealing with Cllr Cohen he was not exactly helpful. No appeal and absolutely no sense of humour! On being ushered back in to hear the verdict, I commented that Cllr Bruce had been warming my blindfold while we waited, a quip that was not well received at all! Its a sad state of affairs when cynical, harmless comments,and generally 'cut and thrust' remarks are deemed to 'bring the council into disrepute' I was of the , obviously misguided, view that Councillors were representative of the Community they serve. It appears our beloved 'Standards Board' have a different view..... Perhaps a dose of syrup of figs, and castor oil would improve their outlook? Rebecca is going to have a field day. It really is time that this whole rotten edifice was exposed for what it is - a shambles. Maybe you should have called him something else - he clearly doesn't like the idea of being called sober. Given his parish council history maybe gerontophobe is apposite. His time will come and when it does he will fall for a long time before stopping. Like all 'Australian Marsupial Courts' and 'Watch Committees' they have a misguided sense of their own self importance, as do Jack and co. Perhaps they should have declared a personal/prejudicial interest? Simon I am facing a standards investigation about Pizza and derogatory comments about the good people of Margate. I will not be lending credibility to this farce by participating in or co-operating with the process. I will publish all documentation relating to this ridiculous process even though I may be instructed not to do. It is beyond belief that in these times of austerity £thousands of public money is wasted in this way. The only way to stop this nonsense is to expose and discredit it. I find the most bizarre aspect of this to be the insight into how little Thanet District Council understand the internet. Seriously. It's ten minutes work to make similar results appear for one of them. Reputation management is serious business these days. Although the Google algorithm is not to be messed with, a structured search can be made to say anything,like statistics. 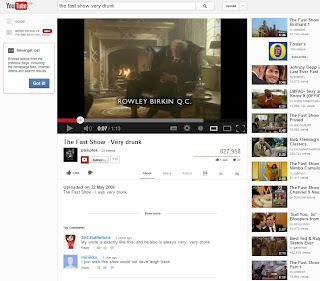 It's beyond belief that in a situation such as this "You Tube Commenters" are cited as a credible source. It is common knowledge they are the lowest strata of the internet (except of course for Yahoo Answers). They will be the laughing stock of the IT savvy. All such petty stuff! Shaming! What I found worrying if not disturbing, was my unexpected cross examination from the council's legal officer, who already knew my defence as I has sought his advice. I thought that his role was to guide the panel on the rules, not act as a pseudo prosecutor? In fact.. think of the courts martial scene in Blackadder in the previous video clip! I was prevented from speaking at the meeting yesterday - so any comments I had to contribute were limited to Simon direct. But I have never seen such a farce in my life. This is not about the party politics, standard breaches or punishments metered out, but about a system of accountability which is broken with inconsistent judgements and incorrect procedure. The councillors and the public need to have confidence in the system which protects fairness and the relevance of the council. When the process can be manipulated by individuals to their own means and punishments can be ignored ( as mentioned by a previous contributor), it is time for an urgent overhaul. I am looking into the gross error of a council officer cross examining a councillor when it is not his position to do so - their attendance is for legal advise only. Maybe you should write your blog posts and forward them to Rob for him to send out into the world! I was seeking something to say in your defence and to lampoon your ridiculous accusers. But I could not do better than the eloquence of Black Adder and Monty Python. It is little wonder that these sketches anger your accusers, who are just bright enough to see their own reflection staring back at them. I would not last the day with this egregious cabal of petty, spiteful, self regarding and frightened Councillors. They serve us badly. I agree with cllr Bruce - no one can possibliy have any faith in this system or this board with such widely varied judgements. Both Worrow and Gregory got away with their crimes because, they were apparently, acting as individuals - yet you, Simon, are consided to be a cllr at all times even on your private blog. Then when Worrow is metered a punishment and told to apologise, he refuses to and nothing is done. Surely a case of bringing the council into disrepute is reasonable against Worrow now - perhaps the population of Birchington would like to take this one. Dear Cllr Driver. I've not had much time for you or your politics but fair play to you in speaking out about how ridiculous this whole business is. As far as I'm concerned, Thanet district council doesn't need any help from Cllr Moores or anyone else to bring it into disrepute. They've more than done it themselves with this farce. In any workplace disciplinary hearing the accused is entitled to bring a friend or trade union representative to observe AND speak on his/her behalf. Presumably the Standards Committee were trying to ape established best practice and failing dismally. Messrs Hart and Poole , as ex-trade union reps, will be well aware of this. Kangaroos 1, common sense 0. Simon - you really must stop giving airtime to the leader of the 'Two Idiots Group' (per your twitter column). Pur..leeease - people are asking him to stay????? He'll be telling us next he's got a knighthood for all the council work he hasn't done! Simon, When you say you were cross examined by the Council's legal officer, do you mean Harvey Patterson by some chance? I don't think I can say so Captain Darling will have to do! Don't whatever you do or under any circumstances, underestimate Captain Darling. May come across as super friendly, but one of the prime movers. Treacherous into the bargain. I assume that if you had taken a high flying QC in as your "Friend" the outcome would have been the same? I believe that in most other disciplinary hearings you are asked if you accept the punishment, you are in a military hearing, and a "no" will move things to a higher authority. This all seems so incredibly unfair. You are so right 4.19pm. There is nothing fair about this and you shouldn't expect it with Captain Darling at the helm. You have to be a loyal member of Iris's crew if you want 'protection'. Cllr Bruce knows all about that. WHAT! Cllr Driver getting on his high horse because he is up in front of the standards committee because he appeared in the press (online and TV) in his official capacity as an elected Councillor of TDC and said that people should boycott a brand new business and that he would use his position to raise the matter with the Council! I think TDC and its toadies have over-reached themselves this time. They've shown themselves up for what they really are about and in broad daylight too. They think they're beyond reproach and can trample anyone they like. Well done Cllr Moores for flushing them out. Come the elections we'll flush them away. You seem to have escaped the clutches of SMUDGER in the IOTG today. JC seems to have a high profile, at least two mentions, including the increase by 70% in the Birchington precept of the council tax following the discovery that the parish council books were not kept up to date. JC is chairman of the parish council, perhaps he should find a better bookkeeper. Cllr Driver (if it is really you), the article by Lisa was published on a Wednesday, she tweeted about it that night and a few people read it, all of Thursday passed without any public outcry, no comments of any quantity on Twitter or Facebook, Friday came and at 10:49AM you posted on Facebook, by the afternoon you were being quoted on the BBC News website and later Friday evening an interview done by you with the BBC was aired on the regional programme. The comment, the interviews were the catalyst of the outpourings of hate and rage directed to GBPizza, even though it was evident that many hadn't read the article, they were feeding off the "outrage" you felt. The Producer of the show said that they asked quite a few people to do interviews, Mary Portas being one of them, but these people for whatever reason declined to pass comment or judgement on the article. You on the other hand, an independant Councillor from Ramsgate made the effort to travel from Ramsgate to Margate to do an interview, an interview that was done by Cllr Ian Driver of TDC who called for the boycott of GBPizza and then went on to say that you would be bringing it to the attention of the greater council, luckily it would appear they took an alternate view of the whole thing (if you raised it at all) as they did nothing and your 15 minutes of news fame back fired as the demand for Pizza grew. The article did not "slag off the people of Margate" it simply showed that Margate and the greater Thanet area has it's problems, BUT even with those problems people are willing to move to the area and open businesses because they BELIEVE that Margate and the greater Thanet area is WORTH INVESTING IN. As a Councillor I think it would have been better for you to highlight THAT FACT rather than, what appeared to many, grandstanding on an article and issue that you clearly didn't understand or comprehend. I hope they throw the book at you, I for one will not be satisfied that you hold the office of TDC Councillor until you have publicly apologised to Lisa and the GBPizza Team, unfortunately as I do not live within your ward I cannot take some measure of happiness by asking my neighbours to BOYCOTT your name on any ballot paper that they get to mark. One thought Rob. Why did lots of people with connections to Margate not want to be interviewed? I read the article and actually thought it was a bit of trash lazy patronising rubbish, written by yet another DFL with all the answers to our problems. You have allowed yourself to be diverted from the thrust of this set of comments, which is the peculiar nature of the TDC Standards Committee, merely because you don't like a man you have never met. How odd. Please rephrase it if you need to but without the childish and unnecessary insult if that's who I think it is! Can somebody tell me what a DFL is? This is the second time I have seen this used today, the first was in the first letter in the IoGT letters page. I have never heard it before today. Thank you Simon, I was puzzling about the neaning of the DFL acronym. DFL's are the life blood and future for Margate, that is if they are allowed to come here. The local and foreign scum that have taken over our town and particularly Cliftonville, have got to be cleared out. People who are net contributors must be encouraged however Labour's new policy of creating even more social housing will have the reverse effect. When it was Lady Porter it was termed gerrymandering. @ Anon 5:33pm , please be careful when posting comments like "local and foreign scum that have taken over our town and particularly Cliftonville" on a website, I'd hate to see Cllr Drivers Sunday rest be ruined by having to travel to Margate to stand outside of the Turner Contemporary calling for a boycott on your business, threatening to take the issue to Council! Oh by the way as a final comment on this post of dear Simons I do love the fact that Cllr Driver somehow equates his calling for a boycott of GBPizza to those calling for billion dollar international corporates to pay their tax or for oppressive regimes to stop subjegating the ethnic majority via Apartheid! You'd think his time would be better served trying to sort out the many issues that his own Thanet Ward is facing?